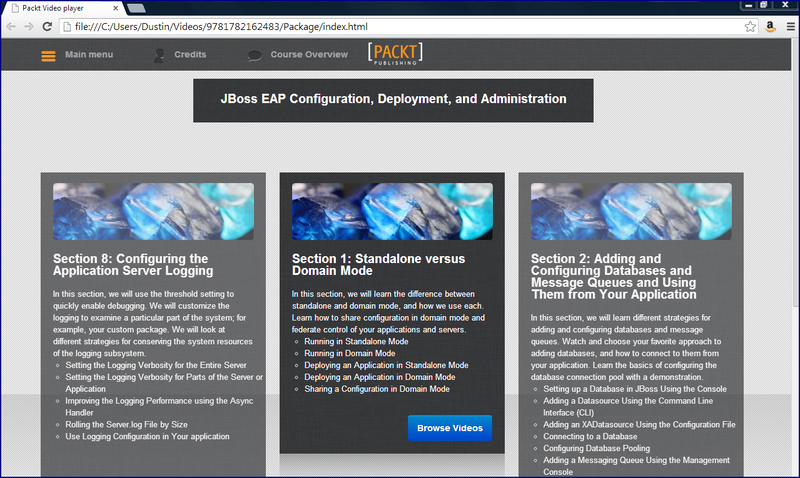 Packt Publishing released the video JBoss EAP Configuration, Deployment, and Administration by Red Hat employee Jason Shepherd in October 2013. This post is my review of this training video on configuring, deploying, and administrating the JBoss Enterprise Application Platform. Like HTML5 Game Development which I recently reviewed, JBoss EAP Configuration, Deployment, and Administration is actually a series of short videos (1 to 5 minutes each and grouped with related videos in sections/chapters) that run in the Packt Video Player within a web browser. The first section (or chapter) covers download and installation of JBoss along with coverage of the basics of setting up standalone instances and domain instances of the application server. Two approaches (command line copying of WAR file into appropriate directory and use of web-based Management Console at http://localhost:9990 with newly created user) for standalone deployment are demonstrated. The first section then moves onto coverage of using command line (emphasizing JBoss AS7's Command Line Interface) tool and web-based Management Console to deploy to multiple instances in domain mode. The second section of JBoss EAP Configuration, Deployment, and Administration contains short videos related to using database and JMS with JBoss. The first video in this section demonstrates using the browser-based Management Console to associate a JDBC driver with the application server using JBoss's JCA support. A MySQL database is used in this example. The second video also shows association of a datasource with the JBoss instance, but uses the Command Line Interface this time. It introduces and demonstrates use of the commands deployment-info and data-source. The third video of Section 2 indicates a third way of configuring a datasource to be used by JBoss Application Server: directly editing the configuration file. The narrator explains why this must be done when the application server is not running and demonstrates changing the configuration file by changing the datasource to be an XA datasource. The fourth video of Section 2 is simply titled "Connecting to a Database," but demonstrates far more than that. In this video, the author demonstrates use of the JBoss Tools plugin for Eclipse IDE. The demonstration shows use of a sample application included with JBoss Tools that uses Java Persistence API to connect to the database (note that installation of the JBoss Tools plugin for Eclipse is demonstrated in the first video of Section 7). The fifth video of Section 2 demonstrates use of the Management Console to configure database connection pooling and demonstrates how to use files provided with the JBoss distribution to learn about more potential settings to adjust. The final two videos of Section 2 demonstrate setting configuring a JMS Queue in JBoss using the Management Console and then interacting with that JMS Queue with simple examples written in Java and displayed in the video in the Eclipse IDE. The third section of JBoss EAP Configuration, Deployment, and Administration looks at troubleshooting and diagnosing performance and memory related issues with JBoss. The majority of the information provided in these videos in this section are not JBoss-specific, but rather cover use of the standard tools provided by the Oracle JDK (and OpenJDK) and by Linux. For example, demonstrated tools include jps, jstack, top (including a useful script for running it periodically), and so forth. There are some JBoss-specific aspects to the videos in Section 3 such as how to specify the garbage collector to use, enabling logging of garbage collection events, and specifying JVM heap sizes that JBoss instances should use. The videos provide introductory detail on analyzing output of these tools (garbage collection logging, thread dumps, and heap dumps) and what common symptoms of the output indicate about potential issues. Useful tools for helping with this analysis are also briefly mentioned: GCViewer (garbage collection), Samurai (thread dumps), and Eclipse Memory Analyzer (heap dumps). After the highly general Section 3 with few JBoss-specific details, Section 4 returns to a heavy JBoss focus with its coverage of clustering and load balancing. This section of videos uses Linux command line options heavily and most of the work is done and verified with Linux commands and viewing output. Section 5 is on JBoss Modules. The author explains that while developers may have run into issues with classes using by the application server being available and even erroneously used by the applications in some previous versions of the application server, JBoss AS7 (JBoss EAP 6) provides special class loading support to help avoid this issue. This section discusses this and also talks about the implicit module dependencies in JBoss. The videos show how to exclude certain implicitly provided modules and how to explicitly declare dependencies on different modules. The videos demonstrate using and changing jboss-deployment-structure.xml files to control JBoss classloading. The final video in this section uses JBoss AS 7: Configuration, Deployment, and Administration to show in writing how JBoss classloading precedence rules work. Although the title of Section 6 is "Deploying Applications," this is not the first section in which deployment to a JBoss application server instance is covered. Instead, this section focuses on more specific capabilities that can be enabled in JBoss at deployment time for performance improvements and for greater security. The first video in this section emphasizes using Java EE 6 Servlet 3.0 asynchronous servlets and shows how use of these improves ability to serve frequently repeated requests sent in as tests using JMeter. The second video of Section 6 is on using SSL with JBoss. This video showed key portions of the "JBoss community document" Using SSL with JBoss using JSSE and moves back and forth between describing concepts covered on that page and video illustrations of how to apply those concepts. The third video of Section 6 uses the servlet-security example of the JBoss AS Quick Starts to demonstrate integrating Java Authentication and Authorization Service (JAAS) support into a JBoss application. I noted that the comments in the referenced servlet-security example were perhaps the first references in these videos to "JBoss Enterprise Application Platform." These comments stated that the example applies to "JBoss Enterprise Application Platform 6 or JBoss Application Server 7." The final video in Section 6 demonstrates how to secure JBoss passwords (encrypt them rather than storing them in plain text) using the JBoss Vault. As with the second video in this same section, the narrator moves back and forth between online documentation (JBoss AS7 Securing Passwords) and video illustration of applying the concepts in the documentation. Although JBoss Tools for Eclipse was mentioned in a previous video, the first video of Section 7 demonstrates configuration of JBoss Tools in Eclipse. The second video of this section revisits JBoss AS QuickStarts to demonstrate use of Maven (jboss-javaee-6.0-with-tools BOM and jboss-as-maven-plugin) to build and deploy JBoss applications. JBoss Tools in Eclipse is the featured tool of the third video of Section 7. In this video, deployment of a JBoss-hosted application via JBoss Tools for Eclipse is demonstrated. Arquillian is the main tool covered in the final two videos of Section 7. The first of these demonstrates running test suites in JBoss with Arquillian and the second video features use of Arquillian with Shrinkwrap to run init tests against a JBoss instance. The final section of JBoss EAP Configuration, Deployment, and Administration focuses on logging in JBoss. The first video briefly references the JBoss Command Line Interface Recipe called Toggle root logger level during runtime with out bouncing the server before demonstrating changing the log level by changing the XML configuration file directly (requires stopping the server) and by using CLI both in standalone mode and in domain mode. This demonstration shows how to set the logging appenders so that different levels of logs go to the console than to log files. The second video of Section 8 looks at setting log levels at category levels rather than at more general system-wide levels. It demonstrates doing this both by editing the file directly and by using CLI. The final three videos of Section 8 look at making JBoss logging more efficient. Techniques demonstrated include using async-handler for asynchronous logging, rolling the generated server.log file based on specified maximum size, and overriding JBoss's default logging configuration with application-specific logging configuration. I liked that JBoss EAP Configuration, Deployment, and Administration generally illustrated these tasks with both the web browser-based Management Console and with the Command Line Interface tool. I find myself using both approaches when working with application servers that support both approaches. I generally lean toward use of the web interface when first learning and then gradually move to the command-line as I start to script steps I am tired of doing manually. It is nice to see how to do things with both approaches. Verbal cues in the narration and examples showing the command-line, Management Console, and Eclipse plugin indicate that it is JBoss 7.1.1 being used in these videos. To the best of my understanding, this implies that it is JBoss Enterprise Application Platform 6 being demonstrated. I don't recall any verbal mention and only a few written mentions of "JBoss Enterprise Platform" in this video, but "JBoss Application Server" was mentioned numerous times in text and verbally. Perhaps my biggest negative observation regarding this video tutorial is that its title might have been better as "JBoss AS7 Configuration, Deployment, and Administration" (which probably was not done because there is a book already with this title). It is not a fault of this video, but a more general challenge is the difficulty differentiating JBoss Application Server, JBoss Enterprise Application Platform, and Wildfly. According to jboss.org community documentation, JBoss Application Server "allows innovation at a faster pace" while JBoss Enterprise Application Platform is described as "a rigorously tested, stable, supported platform for developing and deploying mission critical Java applications and services." The JBoss Application Server 7 FAQ states that "JBoss Enterprise Application Platform (EAP) is the productized version of JBoss Application Server (AS)." The "community edition" JBoss Application Server was renamed Wildfly and the post JBoss EAP and WildFly - a Symbiotic Relationship describes the relationship between JBoss Enterprise Application Platform and newly named Wildfly. The best way I've found to get my head around which version of JBoss Enterprise Application Platform corresponds to a particular version of JBoss Application Server/Wildfly version is to cite the JBoss Downloads page. As of this writing, that page indicates that JBoss Enterprise Application Platform 6.x versions are "built from" AS 7.x versions. Therefore, I can conclude that the videos I am reviewing here are demonstrating configuration, deployment, and administration of JBoss Enterprise Application Platform 6 when I see JBoss Application Server 7 references in the tools and command-line output shown in the videos. JBoss EAP Configuration, Deployment, and Administration should probably not be a person's initial and only exposure to JBoss Application Server or Enterprise Application Platform. A viewer of these video snippets would be better served to have at least rudimentary awareness of how an application server works conceptually and preferably would have at least some awareness of JBoss specific concepts. Although the videos start by showing how to download JBoss, I doubt that someone entirely new to application servers would be able to keep up with the videos for very long. Demonstration of configuration, deployment, and administration of JBoss EAP are done in Linux. It will be easier for the viewer to understand the points the video makes if the viewer understands basic Linux because commands such as ls, grep, less, diff, scp, connect, ip addr show, and ifconfig, are used and Linux tools such as vim and top are used. The videos in JBoss EAP Configuration, Deployment, and Administration will be useful to anyone wanting to learn how to configure, deploy, and administrate JBoss Application Server 7/JBoss Enterprise Platform 6. However, they will be slightly more approachable to those using Eclipse IDE and Linux because that operating system and IDE are used for demonstrations. Although Section 3 had very few JBoss-specific details, this is the type of information that I believe all intermediate or advanced Java developers should know. The author's mixing of Oracle JDK tools, Linux tools, and other available tools provides a good overview of the basics of using these tools to improve performance of any (not just JBoss-based) Java-based application. JBoss EAP Configuration, Deployment, and Administration references written documentation in several of the videos. I like that the author shows the actual page (so it will look familiar when I pull it up in my own browser) and emphasizes the URL so that I can make note of it for later reference. An advantage of this is that a viewer can not only learn the concept being illustrated, but can learn where to go for more details or to refresh one's memory. The best fit for this video tutorial is probably someone with general Java EE/application server experience, but with relatively little JBoss AS7 administration experience. The videos don't waste anytime getting into the core subject and are probably not best suited for someone totally new to Java EE. However, a person familiar with configuring other Java EE application servers should be able to pick up JBoss specifics shown in these short videos without significant trouble. The videos I have reviewed here provide much information in quick fashion, making it easy to quickly see the overall approaches one can use. In some cases, it would probably be helpful for the viewer to have access to online or other "print" details to reference in case small details outside the videos' scope are desired. The audio is clear on all of the videos and the videos was clear on my laptop screen as long as I ran the video in full-screen mode. 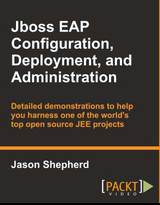 I found JBoss EAP Configuration, Deployment, and Administration to be engaging and informative. These videos provide a mechanism for a person to easily and quickly understand how to work with configuration, deployment, and administration features in JBoss Application Server 7/JBoss Enterprise Application Platform 6/Wildfly.